SAINT AUGUSTINE – Work for the Lightner Museum staff was far from over when the Dressing Downton™ exhibition closed its ballroom doors on Feb. 4. Dressing Downton™ costume curator Nancy Lawson flew in from New York City for the project of dismantling the 36 costumes from the hit PBS seriesDownton Abbey®. The dismantling took longer than a week with help from museum staff and museum curator Barry Myers. This was not. Lawson’s first visit to the Lightner. She worked closely with Myers during its installation in late September – early October, calling it a “duel exhibition” because of all the work Mr. Myers and his staff put into creating elaborate rooms with the Museum’s permanent collection. 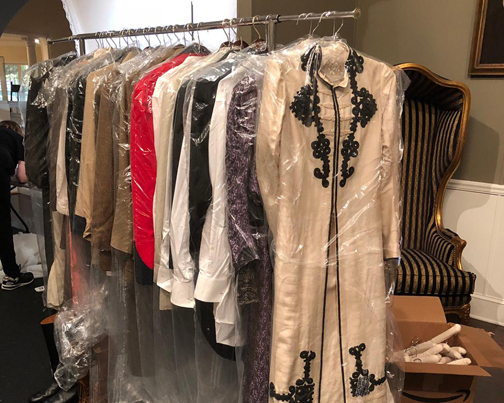 36 original costumes arrived in late September in elaborate crates that Ms. Lawson called “works of art” in themselves due to their craftsmanship. When she left, just before opening day, all the costumes were at their utmost perfection and placed thoughtfully throughout the elaborate rooms that Mr. Myers had created. This de-installation for. Lawson was different from the others. This was the last stop. The costumes were not being put back in to crates. Instead, they were carefully packed into elaborate garment boxes and shipped to London. The naked mannequins were tucked back into their crates and shipped, unclothed, to Atlanta where they will reside in storage. A great deal more of pinning and sewing occurred as these magnificent costumes were delicately hung on hangers, wrapped in plastic, and eventually placed in the garment storage boxes. Lawson said it was an emotional time for her, saying goodbye to the costumes she had been working on for several years and would probably not see again. Now that the costumes, hats, accessories, their mannequins and crates, and all the signs have been moved from the museum and on to different places, the ballroom remains dark and quiet, resting from all that it had just experienced. Visitors gave much feedback from the last special exhibition. A great deal of what we heard was that guests were just as impressed, if not more impressed by Otto Lightner’s collection within the exhibit. Museum pieces were brought down from fourth floor storage, cleaned, repaired, restored and placed in various room settings around the gallery. So, what is next for the Grand Ballroom Gallery at the Lightner Museum? Lightner Museum Curator has plans. “I think our visitors will be delighted to see the outcome of our vision for the Grand Ballroom Gallery in the near future. The art and furniture that was part of the Dressing Downton™ exhibition will stay and be re-purposed into an exhibit called “The American Castle”, said Mr. Myers. Not only will most of the museum pieces be staying in the ballroom, other items from the 4th floor storage space will be brought down and included in this new exhibition. “American Castle’ depicts Gilded Era estates in all of their glory. Much of Otto Lightner’s collection comes from Chicago estates that he purchased after the Great Depression. The Lightner Museum is a non-profit cultural institution sustained by the generous support of individuals, businesses, members and sponsors. Donations are appreciated.